The Federation of State Physician Health Programs (FSPHP) and American Society of Addiction Medicine (ASAM) have both responded critically and dismissively to the Medscape article Physician Health Programs- More Harm Than Good? by Pauline Anderson; Both presumably complacent in the belief that their dismissive criticisms, proclamations of altruistic expertise and brandishment of the “PHP-blueprint” would sway the rank-and-file reader into acceptance without further investigation and stifle further inquiry. “Feel-good” rhetoric and “appeal to authority” are logical fallacies that have, after all worked very well for them so far. But amidst a growing body of severe, serious and remarkably similar criticisms (Over 1200 comments on this and related articles) both the FSPHP and ASAM remain silent. 98% of these comments reflect negatively on the current state of Physician Health Programs and warrant legitimate discussion. This is not occurring and the import of this needs to be recognized. Scientific arguments are won or lost by the scientific method. Either the data supports a claim or it does not. Those who don’t have data to support their arguments deliberately employ logical fallacies in an attempt to convince people that their claim is correct. The 202 comments seen below show how “Social Medicine” commentary can amplify the voices of those previously unheard or who are intentionally silenced. Please read through them and you will see multiple similar and serious concerns and criticisms and valid arguments addressing all manner of misconduct and abuse. Only two individuals have made attempts to defend the current PHP system and both completely avoided the pertinent issues by skirting the key issues presented using all manner of logical fallacy from “appeal to authority” to ad hominem shotgun attacks by a Dr. A.M. Conflicts-of_interest have been identified in both individuals who financially profit from the status quo and the ongoing complete absence of official response to pointed, direct, serious and specific questions involving scientific misconduct, fraud and abuse is patently unacceptable and the import of this must be recognized by both the medical community and general public. I think organizing into a support organization demanding to be heard is needed right now…not tomorrow. I think we need to go to the media, including large ads in major papers, including going after the private “diversion” companies whose shields are untested as far as lawsuits go, and ADA, other friendly advocating organizations. The horror stories presented are so shocking as to belong in the National Enquirer! along with aliens landing etc. except that these are real. 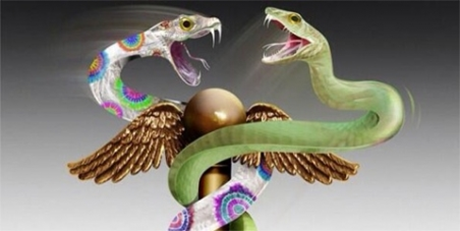 The enslavement and abuse of American physicians (and other health personnel), with promises to expand to other professionals, if not other employees in general (the Maximus strategy) is here, is now, is news worth crowing about from the highest steeple! Remember, “somebody should do something about this; oh wait! I AM somebody!” Lets join up. I am there…tell me when and where. Reblogged this on Chaos Theory and Pharmacology.